Next 10 released an issue brief “California’s Manufacturing and Benefits of Energy Efficiency” (September 3, 2015) in which they engage in magical thinking to conclude that California manufacturers enjoy a competitive advantage and are prospering due to California’s ambitious energy and climate policies. Next 10 Fact 1: California electricity and energy productivity in manufacturing is outpacing the rest of the nation. CMTA: Manufacturers in California must be energy efficient to survive – in 2014 electricity costs were 70 percent higher than the national average. Next 10 ignores the fact that companies not able or willing to pay high electricity rates either shrink or don’t grow production in California, so their energy use profile is not reflected in this “fact”. Next 10 asserts that “companies in California can spend less on energy and redirect cost savings to other areas to boost the company’s competitive edge.” With such high rates, even energy efficient companies have nothing left over after paying the electric bill. Next 10 Fact 2: Electricity bills are lower in California. CMTA: Each company’s size and electricity use profile will determine the size of their bill. Manufacturers use electricity for pumps, compressors, lighting, robotics, conveyor belts, clean rooms, and other process related purposes. Next 10 is silly to compare state-to-state average industrial bills without correcting for company sizes, energy use profiles, and number of firms in each state. Companies certainly have an incentive to make energy efficiency investments to lower their bills when state policies raise electricity rates, but another option is to shift energy-intensive production out of state. Next 10 Fact 3: California manufacturers spend a smaller share of total operating costs on electricity. CMTA: It should be no surprise that as California manufacturing shifts from energy-intensive production activities to more R&D activities that energy expenditures would decline as a share of total operating costs. 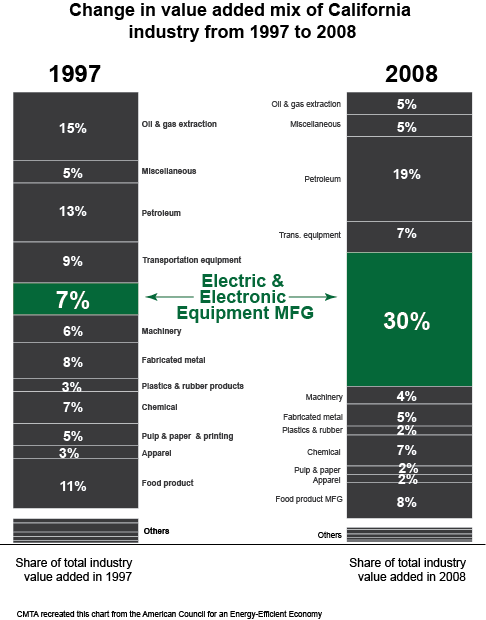 In fact, the shift in the composition of California’s manufacturing sector in the past two decades has been striking - the contribution of electric and electronic manufacturing as a share of California’s value added mix grew from 7 percent in 1987 to 30 percent in 2008 while the share of many other sectors have declined. (See the industry chart below from the American Council for an Energy-Efficient Economy). But even if the composition of industry in California were the same over the last decades, other key information is missing - spending a smaller share of operating costs on electricity could be the result of spending a larger share of operating costs on labor, taxes, and workers’ compensation, or other costs in California. NEXT 10 Fact 4: California is still the top state for manufacturing in the US. Since 2010 California manufacturing jobs have grown almost three percent, while U.S. manufacturing jobs grew by almost eight percent. Since 2010 California attracted less than two percent of new and expanded manufacturing facilities each year. Since 2000, only one year saw investments exceed three percent.